25 Fun First Day of Homeschool Ideas - Look! We're Learning! Back-to-school is an exciting time of year, especially when you homeschool! With new ideas and a fresh start, there is a lot to celebrate. Homeschool parents usually ooze excitement and you want your kids to get excited about the beginning of the homeschool year also. 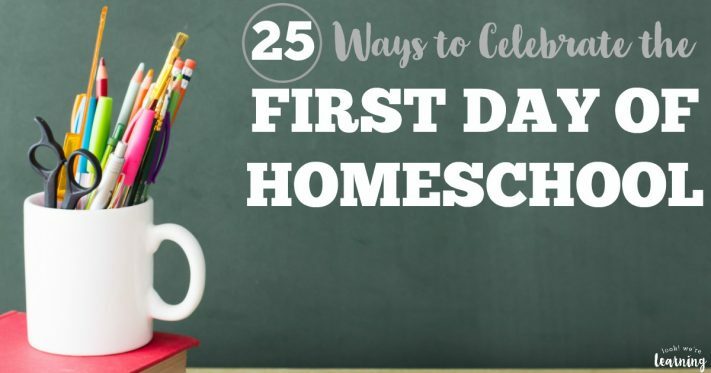 Here are 25 fun first day of homeschool ideas to celebrate NOT back-to-school with your kids this homeschool year! Need some ideas for planning your new homeschool year? Don’t miss our list of 10 new school year resolutions for homeschoolers! 1. Decorate your homeschool room with your kids. This is a great activity for right before your homeschool starts or for the very first day. Grab some fun decorations and get started! Not only will decorating be exciting, but it is also a great way for your kids to have a vested interest in their homeschool. 2. Create a vision board for the year. Setting goals for your homeschool is so important! Start your homeschool year off right by creating a large vision board with your kids. Discuss everyone’s goals for the homeschool year and write them on the vision board. Decorate it and hang it somewhere you can look at it throughout year. It will be fun to see all of the progress that your kids have made. 3. Go out to eat a special breakfast on the first day of homeschool. This is such a fabulous way to celebrate back-to-school! Skip the formal school morning and head to a cafe or restaurant to ring in the new school year. 4. Eat dinner at a fancy restaurant on the first day of homeschool. Shake things up a little bit and take your kids to a fancy dinner. You can talk about your day and what they look forward to for the rest of the year. 5. Have a dress-up dinner at home for your kids. Have your kids wear their fanciest clothes and treat them to a fancy dinner at home. Use a table cloth, fancy dishes, candles and music to imitate a nice restaurant. You play the part of the chef and waiter and go all out! 6. Have a picnic lunch at a local park. Pack your food and drinks and head out! If you don’t have a park nearby, the backyard can be just as fun. Bring a picnic blanket and enjoy your time together discussing the new year! 7. Have a family movie night to celebrate the first week. After a great week of homeschooling, why not sit back and relax with your family? You’ve earned it! Let the kids pick the movie and spend some time together on the couch. Watch one of our favorites “Willy Wonka and the Chocolate Factory” and then try this Charlie and the Chocolate Factory unit study! 8. Gameschool for the first day (or week!). Who says games don’t count for schooling? They absolutely do! Get back into the swing of things with a game schooling day or week. From board games to card games, your kids will build bonds and have fun! 9. Take funny first day pictures. You can set up a “photo booth” with an awesome backdrop, or just make silly faces! The key is to get some great pictures that capture your child’s personality! Hang them up in your homeschool room to set the vibe for your homeschool year. 10. Surprise your kids with a photo book with pictures from the past year. Kids love to see how much they’ve grown! This one takes some advance planning, but your kids will love this sentimental celebration! There are several online options for printable photo books. 11. Enjoy a day (or several!) at a local attraction (children’s museum, water park, etc.) when public school has started back. Beat the crowds at your local hotspots by spending a day playing when public schools are back in session. After the summer rush, this is a nice way to take advantage of a huge homeschool perk! 12. Create a time capsule. Use a shoebox (or a similar sized container) and create a time capsule that you won’t look at until the end of the school year. Items could include: first day of school picture, an interview with your child and goals he or she has. Put the box away (in a place you’ll remember!) and make a note of where it is and when to open it. 13. Start a scrapbook and add to it weekly. What a great way to capture memories! If you can’t keep up with a scrapbook page per week, consider doing it monthly. At the end of the year, you will have captured so many precious moments! 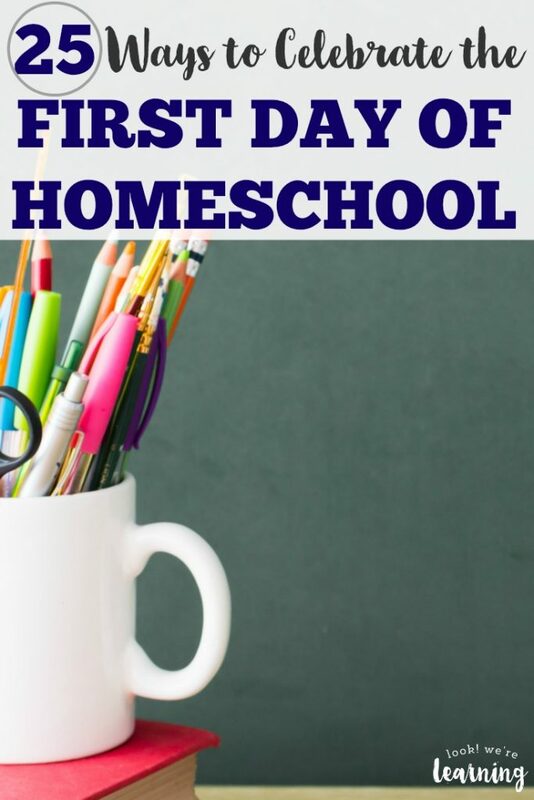 See more fun first day of homeschool ideas on page 2!